The old desert island question is puerile and annoying. If you put a pistol to my head and made me whittle my wine purchases to the bare minimum, I really don't know what I'd do, but Champagne would still be in the top five along with Burgundy, Mosel, Rhone and Bordeaux. I'm almost sure I'd drop Bordeaux long before Champagne, but hell, why should I have to choose? 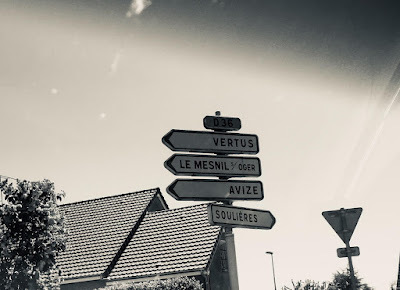 But if I get to choose another road trip with the missus, I'd head straight back to Champagne, visit any of the ten to twenty houses I missed this time, buy a dozen bottles and pay for the overweight and have lunch at Relais de Sillery every day the chef isn't out fishing. Larmandier was the first stop on our getaway to Champagne and Paris. I hardly ever go on the wine route and visit wineries, especially not abroad. It’s one of my biggest regrets in a life otherwise regretless. Or, if not exactly regretless, a life where regrets are easily cast aside. Vertus was a ghost town when we arrived. I know the town, the region, the country, was AWOL celebrating the anniversary of V-Day, but we simply felt trapped in dimension devoid of human life. Lack of humans I can handle, but the even more terrible downside of the situation was lack of open dining establishments. The impromptu cure: an impatient wait for the local Carrefour branch to open and a roadside picnic. Fed and rested, we were now ready for Larmandier. To paraphrase William Burroughs, tasting Larmandier is seeing through to the bottom of every glass. There may be better Champagnes, but none with Larmandier's clarity and purity. Latitude n.v. is lithe, happy and toasty, the Longtitude n.v. more somber, suggestive of darker minerals. The Rosé de Saignée 2015 (technically a n.v.) is very autumnal, by which I mean the Pinot shows leaves rotting on the forest floor just as summer fades and the first rains hit. Terres de Vertus 2011, always Larmandier's most mineral wine, explodes in your mouth. Les Chemins d’Avize 2009 is very complete and again very winey and comes off as the most elegant wine. In both, the character of the fruit is stronger than the character of the autolysis effects. On to the Vieille Vigne du Levant (formerly known as Cramant), as expected it is the fuller and most flavor packed of the lot. We tasted the 209 and 2008,. The 2009 is much readier than the 2008, which would surprise no one following the vintage reports. I'll sum briefly: the Vertus is the most mineral, wiry and wild, the Avize the most elegant, the Cramamt the most complete and complex. And someone should just market them as a three pack because choosing one over the other a wine geek’s Sophie’s Choice. On the way back to our B and B at Epernay, I stopped at the local legend of a wine store, Jean Silvatori. It's a great little store, stocked with both grower champagnes and major houses, non-vintages through vintages and premium bottlings - as well as choice selections of still Champenois and Burgundies. I picked up bottle from a great grower at a decent price of approx 30 euros and we drank it in the garden that evening. Tasting out of crappy flutes is not a good way to hunt for aromas, but as far flavors are concerned, this is a very transparent wine, with broad flavors where the salinity and acidity manage to contain blatantly bold fruit. Bouzy is one of the warmest crus in champagne and this sees a dosage of 8 mg. In the bad flute it feels a little blunt, but on the other hand, its punch has a lot of acid power to it. Only the V-Day clampdown kept me from getting another bottle to ferry back home for a second round with decent stemware. The continued national obsession with the V-Day celebrations forced a break from actual wine tastings the next day and I filled the void in the itinerary with a pedestrian romp at Pommery. All touristy and superficial flash, it's the kind of marquee brand designed to depress the earnest Champagne lover. The following day, though, was very busy, starting off with a visit to one of the the first grower Champagnes I'vd ever bought. I’ve never been able to really pinpoint the character of the Chiquet wines in easy, catchy copy. But after talking with Nicolas and reading over my notes, I think the key is that they artful and practical. The Chiquet family are all about expressing their terroir with careful, artifice-less craftsmanship. This is quite evident in the Nicolas Chiquet's offhand comments about his decisions and considerations in the vineyard and winery. A key decision that exemplifies their approach is to not release a Special Club in 2012, a vintage widely regarded as one of the best in recent decades (alongside 1996, 2002 and 2008) because 2012 made for wines too intense for what Nicoals is looking for. So much for philosophy, but at the end of the day, I prefer to talk about flavors and aromas. In Chiquet's case, that translates to clear fruit flavors with minerals and sauteed mushrooms pulsating beneath. I would have assumed that this would be expressed best with the Special Club, but the 2011 vintage that we tasted was rather demure and delicate and felt stylistically removed from the rest of the lineup (albeit highly recommended). Even though Special Clubs are always no-brainers (expensive but always top value for your dollars), for me, the true representatives of the house style are the Cuvee de Reserve (2011 based in this case) and the Millésime Or, Premier Cru, Brut, 2008. The first more about truffles in mid palate, the latter ripe fruit with a mineral backbone. Lower down the food chain, the Tradition n.v. is always a useful wine, but the real fun begins with the Blancs d'Ay, Brut, Grand Cru, n.v. Sourced as is it is from Ay, a Pinot town, it is different than anything from the Cotes de Blancs, less tense, the Chardonnay fruit evoking Chassagne rather than Puligny, if the Burgundy pigeonholes are any help. Even if Peters was just another grower, he'd still be a grower from a town legendary for having no ordinary wines. As it is, the family has been bottling wine for generations and carving out their portion of world fame in the last few decades. Cuvée de Reserve Brut is very fruity and floral; although at the core you can see the resemblance to fellow Cotes de Blancs grower Larmandier, it is markedly different, mainly due to more overt yeastiness. A very complex nv that will need four-five years more in the cellar. The Blanc de Blancs Extra Brut (pure 2014 but not aged long enough to be sold as vintage) is much more reserved and mineral laden, and while it may not need more years than the Reserve to show its potential, I expect it will always show better. In fact, I suspect the 2008 or 2012 versions maybe even match the actual vintage wine, the l'Esprit. We did taste the l'Esprit 2013 and it was a tough call. The l'Esprit was more Champagne-y and even more yeasty. Is it more complex or was that a mirage sprung of the flattering brioche aromas conjured by the yeast? The Rose For Albanne is a an assemblage of still red wine bought from friends with a blend of various vintages of BdB wines, it is almost sherbet fruity on the nose, yeasty on the palate, close to an extreme at this stage of its life. The house's flagship is the single cru Chetillons, one of the grandest of this Grand Cru village's vineyards. Chetillons 2011 is still all chalk and yeast, unbridled power for now, a long distance and tangent away from a 2011 like the Chiquet Special Club (just a warning against generalizing on the vintage). "You probably don't want to spit this." Open for a week, its mousse on the decline even stoppered, it was all nuances of mushrooms and broth, its past and future trapped for an eternity in our tasting glasses. I had no experience with Paillard prior to the visit. They're not imported to Israel, I'd never bought them abroad and none of my friends had ever brought a bottle to a tasting. I'd read about them in Peter Liem's book about Champagne and simply took a chance and sent off an email. Alice Paillard wrote back and invited me over for a visit and it all worked out quite well. Alice is a terribly charming and attentive host, walking me and a group of Italian restaurateurs through a tour of the winery and a barrel tasting and on to a short, yet instructive, tasting of the latest release. She's the kind of wine lover who can provide fruitful insights on any wine you'd care to share with her. The house's wines are very finely expressed, elegant wines, almost the opposite of what I expected from a relatively big house. For once, a big house's inbred hype rings true. Elegance and complexity reign over power, and even the relatively big boned vintage BdB is a marvel of efficiently expressed complexity. I really wish I'd brought some back to Israel, but, low cost airline, only one checked in luggage, yadda yadda yadda. Premier Cuvée Extra Brut n.v. (disgorged 9/17): a delicate nose with citrus, light minerals, then spices. With loads of finesse, albeit without obvious complexity at this point, this is patently not just a brand, but rather a delicate wine made with care. Rose Premier Cuvee Extra Brut n.v. (disgorged 10/17): even though initial sniffs don’t show a lot of red character, eventually I get light strawberries and spices. On the palate, it creates a trompe l'oeil of sweetness and spiciness embracing the same elegant body. Blanc de Blancs ,2006: blossoms, chalk and light toast on the nose. Where the nv’s were delicate, this is more assertive and broad, brimming with chalk.